The town of Spoleto in Umbria is located on the western side of the Apennines, just 75 miles north of Rome. It sits at 396 meters above sea level. It is famous for being host to the Festival of Two Worlds. This was originally begun by composer Giancarlo Menotti in 1958. Menotti wanted a way for young American artists residing in Europe to explore and share their many talents. This summer festival offers a mix of theater, dance, music, opera, and visual arts. Initially, this town was a Roman colony located on the Flaminia, which was built in 3rd century B.C. It served as the main road which connected Rome to Rimini. Spoleto in Umbria had many different rulers. Once Rome had fallen, it was taken over by the Goths. Following that regime, it was a Lombard duchy in 576. Perugia took it over in 1324 until the Papal States gained control of it. Due to the influence of so many different rulers, Spoleto has many types of architecture. A lot of this can be viewed even today. Visitors can still see the remains of inside and outside city walls of the Umbrian polygonal and medieval types. Other architectural sights include Roman and Renaissance along with modern structures. 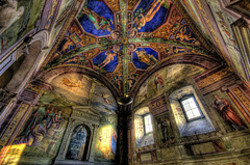 Spoleto in Umbria also boasts the church of Saint Peter, known as the Duomo of Spoleto. This church has one of the most impressive facades in Umbria. It was built during the 5th century, with the façade added in the 12th century. The interior of the church was done in the 18th century. The middle door in the façade is surrounded with a mixture of themes from fairy tales, the New Testament and medieval animals. Visitors flock to the town of Spoleto in Umbria each year to see the amazing architecture and the church of Saint Peter, as well as coming to enjoy the festival of arts each summer. The local food is another reason to make this a stop on your tour. Not only is the food an exquisite dining experience, you can take home some of the homemade products of olive oil, mushrooms, wine, truffles, sausage meats, chestnuts and honey. There are plenty of accommodation options available in Spoleto including hotels, bed and breakfasts, self catering residences, holiday homes, and camp site. Umbria rentals are really varied. If you are interested in how farming works in Spoleto, there is this type of accommodation, as well.